1. Take Risks and Start the Journey. Disclaimer - this feels a lot easier when you are young. I am so glad that I hiked the AT at age 21 and started a company at age 24. In a lot of ways I didn’t know any better. After having a family + mortgage starting a company and adventuring feels so much scarier! However, it is still worthwhile... and I have to remind myself of that constantly. Know where you are going and try not to get lost! On the trail, you can look for blazes, keep maps handy, and stay found with GPS. In business you want to make a business plan and set short term goals. Here’s the kicker... you’re still gonna get lost and find yourself off-course. So take your bearings frequently to make sure you don’t get too far off route before needing to retrace your steps... which is almost always preferable to bushwhacking. The amount of weight you carry directly impacts how far and how fast you can travel. On the trail a lighter pack means that you have to expend less effort walking down the trail. In business low overhead, “or having a small nut” as my husband likes to say, gives you more flexibility to make adjustments and it decreases stress. 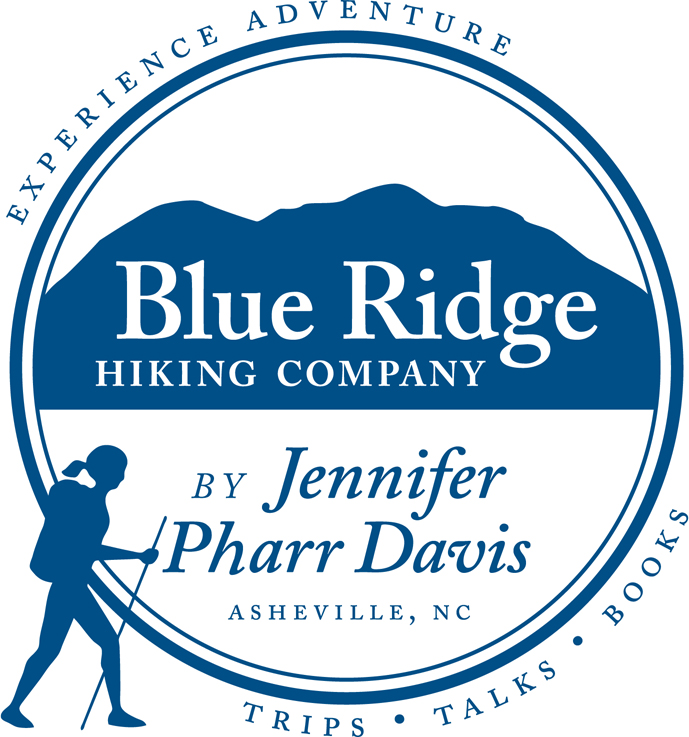 Blue Ridge Hiking Company is ten years old and we have focused entirely on service. We exist completely online and only now are considering adding vehicles and a gear buying option as part of the business model. I feel more confident adding additional cost and assets to the company at this point because we have proven that we can carry our existing weight. Likewise, I recommend that thru-hikers start with only what they need in their pack and then add the items they want to carry after successfully adjusting to the trail and mileage. Having a ‘Type A’ personality (guilty) is usually good in hiking and business, but it can also be a negative attribute. If you are highly driven then you like to define the path and stay on it. But it can be hard to remain flexible or change plans in route. The AT is a great path for linear thinkers and hikers, most years you can start at one end, hike to the other end, and pass every white blaze in between. However, when I hiked the Pacific Crest Trail, I had to take a two week break to let snow melt, skip a middle section for a wildfire, and take an alternate route to Canada. But I made it... and then I went back and picked up the miles I skipped (remember, Type A). The AT fed my goal oriented personality, but the PCT taught me how to adapt and remain flexible. In hiking and business stubbornness and adaptability are two opposing and equally important qualities. And sometimes in order to keep going you have to pause, skip ahead, or take an alternate route... even if you’re Type A. 5: Pick Your Hiking and Business Partners with Care! Close friends - and spouses - are often NOT the best people to work or hike beside. Oh man, this is a hard lesson to learn and unfortunately I have lost some friendships figuring it out. Just because you get along with someone really well does not mean that you are going to share the same business goals or hiking styles. On the trail, I have had some teary exchanges because I can’t figure out how to move forward with someone who I care about. If one person is miserable or if two people are both compromising too much, it’s not going to end well. Just because you would do anything for someone, doesn’t mean you should do everything with him or her. The best hiking and business partners in my life are the ones who share common goals + mutual respect and communicate clearly. Sometimes stopping is absolutely the right decision, but not when you feel too bad to make a good decision. When I went for the AT Record, Day 12 was the low point. I had shin splints, some major GI issues, and some weird side effects from a bout of hypothermia. I told Brew Davis I was done... and he told me I could quit the next day, but not right then. The next day, I felt better and wanted to keep going. In year seven of Blue Ridge Hiking Company, there was a two month span where our Head Guide left midseason, our books were a mess, and we had to do an emergency evac for a client who broke her ankle - and I had a two year old at home. I felt like I couldn’t handle it all. I was SO ready to quit. But we decided to give it one more year and the following season was one of the best on record. All that to say, in business and hiking, when you are ready to quit always commit to going a little farther... and then see how your feel. You can never underestimate the value of learning from other people’s experiences. I didn’t know what the heck I was doing on my first thru-hike. Going to Warren Doyle’s Appalachian Trail Institute was immensely helpful in planning and preparing for the trail. He has hiked the A.T. 17 times and at this point I have been picking his brain, following in his footsteps, and contra dancing with him for 14 years. Likewise, I had never run over 26 miles before I met David Horton. (He has run > 100,000 miles). He talked me into my first ultra, coached me through it, and held me up with a big bear hug at the finish line. Warren and David both helped me on my A.T. record. I never would have attempted that feat - and I certainly wouldn’t have been successful - without their wisdom and support. THANK YOU! In business, I schedule frequent meetings with SCORE Mentors, a non-profit group that counsels small businesses for free. I also try to find folks in the same profession and educate myself vicariously through their ventures. I recently started meeting quarterly with two female entrepreneurs in the outdoor industry (Anna Levesque and Aspen Roots Collective, PLLC) so we can learn from one another, lift each other up, and stay accountable to our goals. In work and hiking, give back to the community that supports you. If you are a hiker then consider joining a local trail club, participating on trail crews and making donations to conservation groups like the Appalachian Trail Conservancy. If you are a business you should volunteer within your community. Our Blue Ridge Hiking Company guides have put in work days to remove invasive exotic plants, disperse the campfire rings from stealth campsites, and they try to pick up trash whenever it’s left on the trail. We also donate to groups like the Carolina Mountain Club and the Mountains-to-Sea Trail. Sure, you don’t HAVE to volunteer or make a donation to stay in business or hike a long trail, but it makes the experience so much better! Burnout is real. It can happen on the trail and in business so PACE yourself! On the trail a Zero day means NO miles - just hanging out in town, relaxing, chowing down, and washing those dirty stinky hiker clothes. In business my Zero days are when I don’t work AND don’t check email. Instead, I hang with the fam, get some exercise, chow down, and wash some dirty stinky family laundry... or I let the laundry pile grow and read a book. You are not entitled to good weather, good days, or success! Thru-hiking and business - and LIFE - will be hard. Expect it, enjoy it, embrace it. There were two weeks on the Appalachian Trail where I had wet feet everyday. Initially, I was frustrated and uncomfortable. Then I realized I could splash in puddles and wade through streams. If your feet are wet then you might as well play in the water! We traveled to CO for work meetings this week. Brew came to watch the kids then he got sick and I lugged Charley and Gus around Outdoor Retailer to attend meetings with me. It was exhausting and awesome. Gus came with pants and left without them. (You can deduce why.) Charley went “trick or treating” for candy at the booths and there was one point where she laid prostrate on the floor and refused to move. #soprofessional But having my kids at OR helped remind me of what’s important and why I work hard to support my family. Plus now we have a bunch of candy to eat.